Durian probably is (or should be) on any list of “extremely strange fruits” out there. Durian literally means “thorny” because of the hard thorny outside shell. They grow on trees, and can actually be dangerous if they fall on you (they vary in size, but are about the size of a human head). 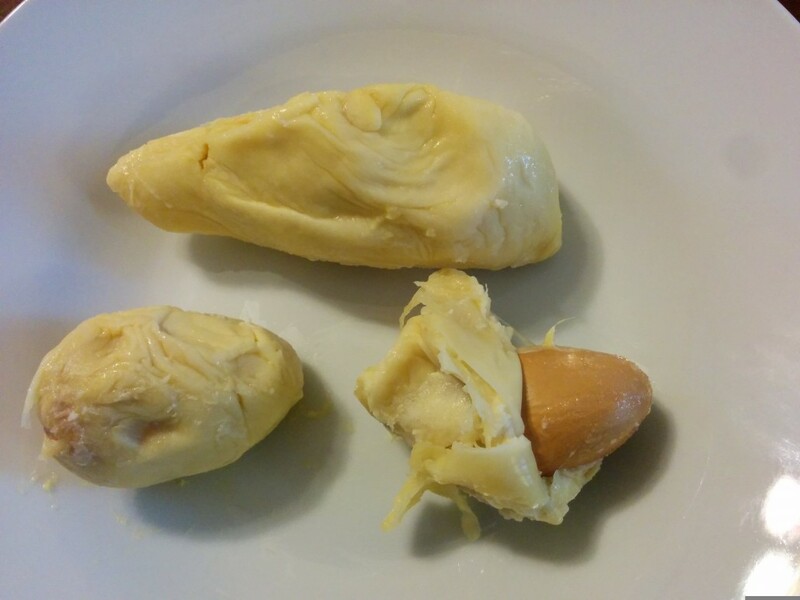 Inside the durian, there are segments of yellow flesh surrounding large seeds. The flesh is soft and creamy/sticky, almost like a custard or mashed banana. 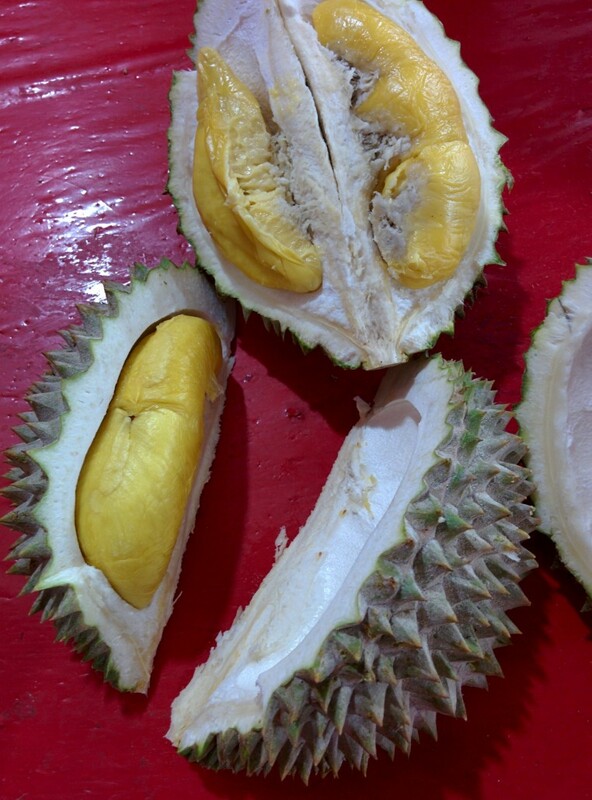 The smell and taste, however, is what really makes durian unique. The smell is extremely strong, pervasive, and lingering – durians are banned in a lot of hotels and from most public transportation. Its smell is also very distinctive, and not immediately appetizing (actually pretty unappetizing) unless you’re a fan of durian and have associated it with actually eating durian – it smells a bit like a rotting sweet onion, and comparisons to the smells of sweaty feet, body odor, sewage, and certain petroleum products like gasoline are not uncommon (nor really inaccurate). The exact flavor of durian varies depending on what kind you get (there are a number of different cultivars, each seems to have a somewhat different flavor and price). The general “durian” flavor though is like a sweet pudding, with onion and garlic (sulfur) and toasted almond. The aftertaste leans much more heavily toward the sulfur/onion/garlic taste, with more than a hint of some quality that would be associated with something putrid or fermented. The taste and smell lingers in the mouth and on the hands for quite some time after eating (and burping after eating durian rather seems like you ate a few cloves of raw, possibly rotten garlic). We both like durian quite a bit – like many things though, it’s an acquired taste (and people are always surprised that we have eaten it before AND like it). All kinds of durian products are available – durian cake, durian candy, durian puffs (puff pastry with durian filling), durian ice cream, durian chocolate, durian cendol… We’re probably going to miss durian when we return home.